Another worthwhile contribution to the outstanding What Are They Saying About...series is this volume by Mark Harding dealing with the pastoral epistles. 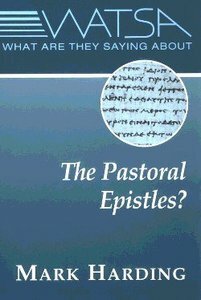 In it the author gives an overview of seminal and recent trends in scholarship on the three pastoral epistles; 1 and 1 Timothy and Titus.A select bibliography and suggestions for further study complete this significant work, the first of its kind to survey scholarship on the pastoral epistles. Written for seminary and university students, this book will also find an audience among preachers looking for a concise introduction to the letters, and historians of of the first century CE Greco-Roman era. About "What Are They Saying About the Pastoral Epistles"